Monday August 13, 2018 - Kieni MP, Kanini Kega, has accused Leader of Majority in Parliament, Aden Duale, and his Minority counterpart, John Mbadi, of being behind the rejection of the contraband sugar report last Thursday. Speaking on Sunday, Kega who heads the Trade, Industry and Cooperatives Committee alleged that Duale and Mbadi were behind the decision by MPs to throw out the sugar report. The lawmaker said he is ready to engage the Directorate of Criminal investigations (DCI) and the Ethics and Anti-Corruption Commission (EACC) to investigate the MPs who allegedly received bribes to reject the report that implicates senior individuals in Government. According to a source, over 150 MPs from both Jubilee and NASA were bribed with Sh 10,000 each to reject the contraband sugar report. “Everybody present at the National Assembly on Thursday will be investigated to tell the truth but Duale and Mbadi must be the first to respond to queries,” Kega said. “Some leaders are not setting a good example to Kenyans,” Kega added. 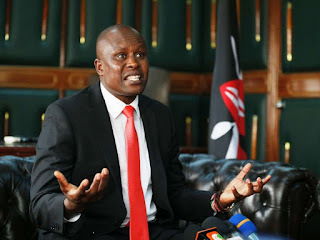 Kega spoke as the Speaker of National Assembly, Justin Muturi, asked DCI and EACC to investigate claims of bribery in Parliament over the contraband sugar report.